Composed salads, those salads with several ingredients attractively arranged rather than tossed, incorporate artistic sensibilities. The “composer” envisions the color and texture of the edible “painting”, orchestrates the melodic balance of flavor and, most importantly, satisfies one’s appetite with a savory salad. My plate is my palette and I prefer using white plates or a large white platter for composed salads, allowing the ingredients to take center stage. Having all of these ingredients assembled in advance, the “mise en place”, is most helpful. Pomegranates and pears are delicious, seasonal fruits and can be found at most produce markets at this time of the year. Tonight my dinner salad will incorporate pomegranate seeds plucked directly from the fruit, though I’ve noticed convenient pre-packs of pomegranate seeds available. A bit of maple syrup whisked into the balsamic vinaigrette adds a subtle sweetness balancing the fresh, tart taste of pomegranate. If time allows, soak shallot in vinegar for 30 minutes. Whisk together oil, shallot mixture and maple syrup. Adjust seasonings adding kosher salt and freshly ground pepper to taste. Toss 1/2 vinaigrette with frisée and raddichio, adding remaining dressing as desired. 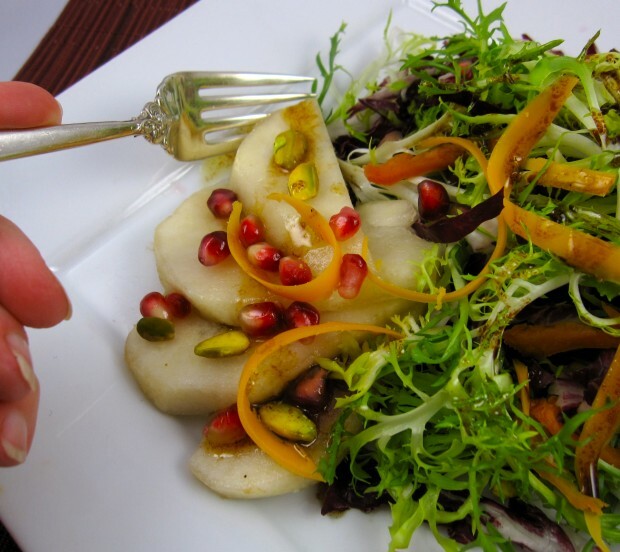 On a large platter or 4 individual plates, arrange pears next to or atop lettuces. Sprinkle with pistachios, pomegranate seeds and shaved cheese, if using, and serve.